Xinhua: While proving age is merely a number which is nothing to do with your passion, 96-year-old Karthiyani Amma (Malayalam term for Mother) was among the 40,440 people appearing for the literacy examination conducted by India’s Kerala State Literacy Mission on Sunday. Kerala, the southern state of India, has a high literacy rate compared to other states of India. Karthiyani Amma took the examination at the Cheppad government LP school, Literacy mission sources said. Driven by the urge to read and write, the nonagenarian enrolled herself in the state literacy mission’s “Aksharalaksham” program six months ago. 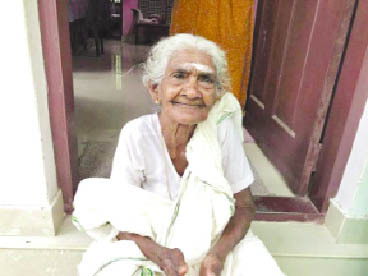 The oldest examinee of the state appeared for the exam at the government lower primary school in Cheppad and was tested on reading, writing and mathematics in the 100-mark paper. Eighty inmates from various prisons also wrote the examination. A mission press release said 11,683 people from Palakkad district appeared for the exam, in which reading, writing and mathematical abilities of the examinees are tested. A total of 2,420 members from the scheduled caste community and 946 from scheduled tribe community also took up the exam.